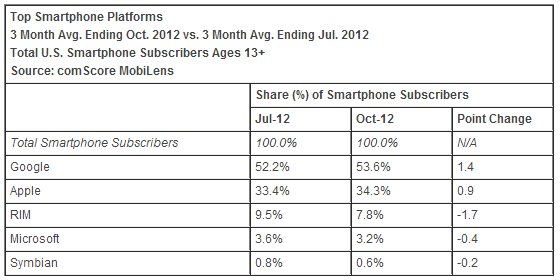 In the US, Samsung remains the top mobile OEM, although Apple is attempting to catch up as it moves into second place. Rounding out the top five are LG, Motorola, and HTC, all of which are losing market share. The story is similar in the platform space: Google is first courtesy of Android, Apple is second with iOS, while RIM, Microsoft, and Symbian are all down or dead (take your pick). 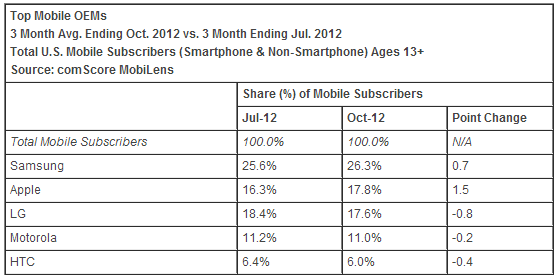 The latest data comes from comScore, which as usual surveyed over 30,000 mobile subscribers in the US. The analytics firm says 121.3 million people in the US owned smartphones (51.9 percent mobile market penetration), up 6 percent between July and October. As you can see, Samsung gained 0.7 percentage points from 25.6 percent to 26.3 percent while Apple jumped 1.5 percentage points from 16.3 percent to 17.8 percent. LG fell to 17.6 percent, Motorola dropped to 11.0 percent, and HTC was down to 6.0 percent. In fact, Apple’s gain was LG’s loss, as the former surpassed the latter to slide into second place. Apple’s recent win can of course be attributed to the iPhone 5. LG may thus be able to grab silver again, if Google ever manages to get enough Nexus 4s to customers. Apple may be seeing big jumps as a mobile OEM, but Android is ahead and growing faster overall when compared to iOS. Google gained 1.4 percentage points between July and October (up from 52.2 percent to 53.6 percent) to further pull ahead in first place. Apple meanwhile increased its share by 0.9 percentage points (moving from 33.4 percent to 34.3 percent). RIM was the biggest loser, dropping like a rock as it fell 1.7 percentage points (from 9.5 percent to 7.8 percent). Microsoft and Symbian didn’t fare so well either: they lost 0.4 percentage points and 0.2 percentage points, respectively. It’s always crazy to see Microsoft down so much despite its Windows Phone push, while Symbian’s losses are of course to be expected. Before the end of the year, not much will change. Samsung will hold on to gold, while Apple and LG will continue to duke it out. Android isn’t going anywhere but up, while all eyes will remain to see if Windows Phone can pull anything off. If not, it will be up to BlackBerry 10 to grab third place next year.